I love gutting fish. It's such an integral part of preparing a fish meal that is so often already done for you. Maybe this comes from my childhood summers hanging around the fish market on Martha's Vineyard–an island off the coast of Cape Cod with excellent aquatic eats–where my brother worked as a teenager. I learned how to scale fish and make perfect cuts of sushi grade tuna before I even learned how to ride a bike. So you can only imagine my delight upon learning a new fish gutting skill. 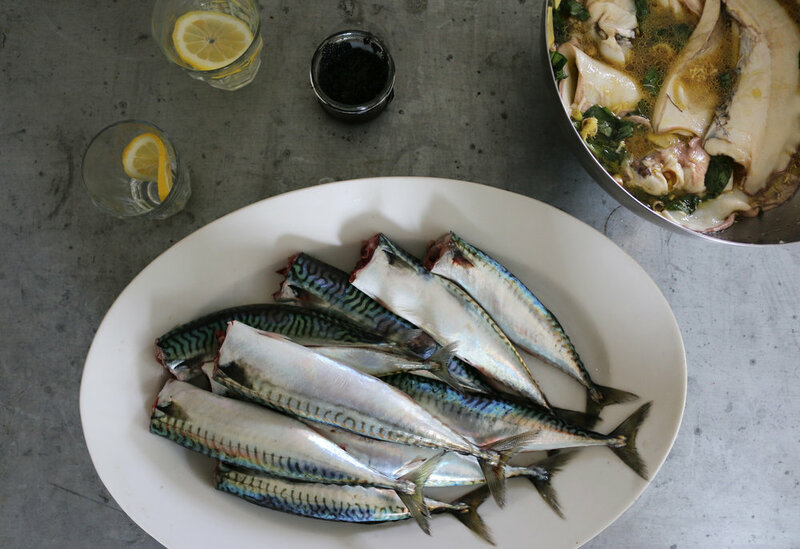 If you're planning to grill whole mackerel, all you need to do is chop off the head just under the gills, slice open along the belly, and squeeze up from the tail and everything will come right out. The cavity can be stuffed with herbs like rosemary, salt, pepper and lemon and thrown directly on the grill. Sometimes I liked to coat the skin with olive oil, but adding salt and pepper to the inside will have a stronger effect that if used on the outside of the fish. The same goes for poultry. Grilling in France is a bit different from the hotdog and beer American aesthetic. The French version goes more along the line of wood fire grills, fresh vegetables from the morning market, fish bought straight off the boats at the harbor, and a lot of wine. I love this kind of dinner. Everyone is involved and there's something so casual about tossing marinated vegetables and whole fish onto the fire and standing around it in a circle with a glass of white wine in hand, waiting for a consensus that the eggplant and mushrooms have been sufficiently charred. Even though this outdoor cooking method is quintessential to summer, I plan to make some early evening autumn meals, this time with our friends wrapped in warm blankets, watching the fire while sipping mulled cider. Coat vegetables in olive oil, white vinegar, S+P, and spices like paprika, curry, and cumin before placing on grill (20 minutes, turning a few times) or in oven (400ºF/200ºC for 20 minutes). Clean and gut fish: chop off head just under gills. Slice the fish along the belly to open. Squeeze fish upwards from tale to remove guts. Rinse and pat dry with paper towel. Make several diagonal cuts along the outside of the fish to allow heat to penetrate evenly. Rub olive oil, salt+pepper along the outside and inside of the fish. Stuff the cavity with aromas like herbs (rosemary, basil, thyme), thin lemon wedges, chopped up garlic. Grill fish for about 10 minutes per side. To check for doneness, insert knife into thickest side. If the meat is white and gently pulls apart, it is done; if it still holds together and is slightly translucent, continue grilling. In a large bowl, add octopus, scallions, chopped basil, garlic, lemon juice, olive oil, S+P. Toss and set aside to marinate for 30 minutes. Place octopus and marinade into a large saucepan and cover with water. Simmer for 30 minutes to an hour (depending on size) until tender. Remove from liquid. This step can be done the night before and the octopus refrigerated for up to 24 hours ahead before putting on grill. Place octopus on the grill with high heat, spreading out tentacles evenly. Grill very quickly, just long enough to char the outside of the octopus.